Copyright © Nancy Allan. All Rights Reserved. "Anyone who loves a good mystery grab this book & buckle up for an exciting read. Fast, furious & heart pounding good." ​"OMG...if my eyes would've permitted as well as time, I would have read it straight through. It kept my attention from page one." ​​In a heartbeat, a single mistake can alter everything . . . and suddenly you realize . . . life will never ever be the same. 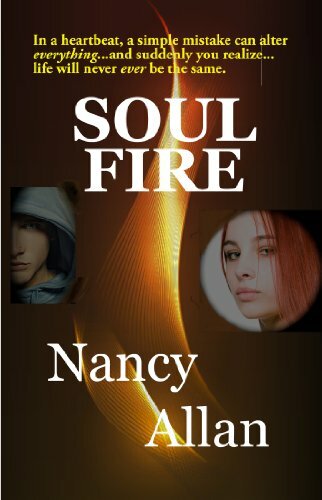 Soul Fire is an emotionally charged story of one girl's fight to overcome the horrors of bullying, her endeavor to right a wrong, and how her exuberance for life along with tender young love, loyal friendships, and having a good family help her survive. Alone, with a fall gale howling around the rafters, Amy Johnstone hears something strike the window behind her. She turns. A woman’s rain-streaked face stares back at her through the dark glass. The woman's face is identical to her own! In her quest to learn who this woman is, Amy's life changes drastically. Something unfamiliar and unstable surrounds her and those she loves. She is catapulted into a world she knows nothing about--a place where her life is in constant peril, and where she believes her child has been taken. WINTER’S DESTINY is an edge-of-the-seat thriller - love story set on the rugged Pacific Coast of Oregon. Here, the story reaches its unique and spectacular conclusion. ​​​​"I laughed, I cried, and I thoroughly enjoyed reading this engaging story!" ​"I was captivated from the first page!" "AMAZING. That's all I can say. This book was wild and crazy but still so true and real."